Huschke von Hanstein - SS officer? I recently read some discussion about a German sports car driver named Huschke von Hanstein, who won the shortened 1940 Mille Miglia in a BMW 328. What was interesting is that his racing overalls featured the "SS" logo, while the car featured the SS logo on the side, as well as having number plates with a "SS" prefix. Did von Honstein have an official connection with the SS? Could he have been an SS officer who raced as well, hence the SS identification on his overalls and car? First of all, it was Hanstein, Huschke von Hanstein as he was known but his full name was Fritz Huschke Sittig Enno Werner von Hanstein. He was a Freiherr, which translates as Baron. Von Hanstein was member of the motorized SS and his own BMW 328, which he bought in 1938, carried the license plate SS-333. The SS entered his car frequently at sports car races, organized transportation for him and a mechanic for his car. I do not know his rank within the SS. This is of course the same Huschke von Hanstein who served as Porsche's team manager for many years after the war. Here is an earlier thread on von Hanstein. Wasn't the SS aspect some kind of 'honorary' (for want of a more apt word!) thing bestowed on most of the top german drivers of the time? I think that in his book, HvH gives some information on this matter,will check tonight. All American boy Dan Gurney could not believe his eyes when he was invited to von Hanstein's home in the early sixties, noticing a photo prominently displayed with his host in SS uniform. Only Bernd Rosemeyer, who apparently never wore his uniform. Most of the drivers were co-opted into the SA. The SA was disbanded after the Night of the Long Knives. The drivers were members of the NSKK, which began as the motorised section of the SA, but was later incorporated into the NSDAP (Nazi Party). Von Hanstein is on record as saying he joined the SS "Because they had the nicest uniforms". I found a picture of von Hanstein's 328 with the SS markings. You couldn't get in the SS that easy. You had to give evidence that you were 100% 'Aryan'. Also, every member of the SS had to take an oath of loyalty to the party and to Adolf Hitler personally. So I'm very sceptical about the possibility that you could be made member of the SS without knowing and wanting it yourself. And I'm pretty sure that, say, Caracciola or Stuck weren't SS members. "During the phase of the 'Gleichschaltung' (= getting all previously independent organizations of the country into Nazi control) Hanstein´s horse riding club was incormporated into the SS, which from now on cared for his motorsport license. Hence it was a noble society, young prominent persons, diplomats noblemen, among them even "friendly" foreigners, who all were members of the '1st Reitersturm Berlin', which had also a motoriing department. Hanstein remembers: 'Most of us regarded the black uniforms much more elegant than the brown shirts of the NSKK'"
So according to that he did not join the SS explicitly because of that uniforms, but as I understand they made it easier to stay. Were there indeed Non-German members of the SS? This is in fact von Hanstein´s own car (here at Schotten in 1939). The Mille Miglia winning car did not have any SS symbols on it. 20.000 Dutchmen for a start.... Many of them fought at the Russian front. Helmut Bott was a Tank Commander according to Brian Redman. It was quiet common for Germans to be in the military if they were between the ages of 11 and 85! I think it was called World War II. If you didn't get with the program there was a fair chance you would have got shot. Hell, they even shot Rommel! It was quiet common for Germans to be in the military if they were between the ages of 11 and 85! I think it was called World War II. I hope you don't confuse the SS with the army (Wehrmacht)..... Very, very different organisations! The SS was a 'volunteer' elite organisation founded on a theory of racial superiority. Something different from an regular army. They were part of the Waffen (fighting) SS, which was a later development. SS brigades were raised in a number of countries: there were certainly French, Belgian, and Nordic (Norwegian/Danish) battalions, as well as the Dutch (which I think was the biggest). I'm uncertain whether there were any foreigners in the pre-war SS though. Yes, he did take poision to protect his wife and his young son who later served as Mayor of Stuggart for something like 25 years. Nazis and SS were all over Swabia, in fact Herr Porsche was himself put in a French prision for being too helpful to the Reich. I think if you went through the Porsche roster in the early days you'd be shocked who did what, when and where during the war! David, speaking of Porsche, you mean held ransom in France, no? ;) BTW, he not only produced tanks, but I believe made modifications to turret which was know as Porsche turret (for King Tiger). Speaking of drivers, one could assume joining NSKK would be preferable to facing a regular draft later on. Might've seemed like office job compared to prospect of being sent on the front... Just a thought, I have no hint of a proof for that assumption. .....And I'm pretty sure that, say, Caracciola or Stuck weren't SS members. Apart from the fact that Caracciola's leg injury would have exempted him from military service, he went straight from the final race to Switzerland and stayed there. prior to and up till the end of 1941 there were no 'foreign volunteers' as they were called, of the waffen ss. germany's catastrophic losses on the eastern front were cause for himmler and the other ss leaders to re-think their 'pure aryan philosophy' when it came to enlisting waffen ss soldiers from the foreign/conquered territories. Are you confusing 'German' with 'Aryan'? THe SS had always been based on race, not nationality. The use of these 'foreign' SS regiments had nothing to do with the catastrophic losses later on. Of course Von Hanstein was in the SS a good while before the war started. At the same time by his own account he wasn't much of a military man, more or less pursuing a civilian life until his imprisonment by the Gestapo in 1943 for attending a party at the Brazilian embassy in Budapest. After this he was transferred to the Russian front, serving in a tank recovery unit until he deserted in 1945. How true is any of this? He does admit to doing some spying for the Abwehr in his pre-war racing days though. Scheivlak- I think You're giving too much credit to consistency of Nazis in their theories... Aryan may have been the word they were throwing around, but let us not forget the Italians, Hungarians, Slovaks and Croats (and I'd guess Romanians) were oficially allies, despite their racial origin. Croats and Slovaks at least had their Waffen SS units, in which people were recruited regardless of race or religion (I believe one Muslim unit was in process of making, with Bosnian Muslims). Photographs of former FIA Prsident. Jean-Marie Balestre, once appeared in Autosport. The uniform he wore was black and the jackboots shiny. he was a member of Le Legion de Charlemagne (called Karl der Grosser in Germany, he being a Frank and well-remebered in Frankfurt, could be a connection there.) Balestre successfully sued Autosport. His story was that he he was a double-agent, he was a member of the Resistance, he said, who had infiltrated the French branch of the SS. It would make Balestre the only member of the Marquis to have infiltrated the SS and itis my understanding that his claim is not accepted by every member of the Resistance. I believe that about 50 British prisoners of war were persuaded to join an SS unit. I guess there would have been around 50 followers of Sir Oswald Mosley in the camps. If you are a professional, sweating time in a camp, you might be tempted by a smart new uniform, pay and three meals a day. There were fifty Brits, I believe 'St George' came into the title of their unit. Fifty soldiers do not make a battalion, let alone a regiment. Von Hanstein's BM which won the 1940 'Gran Premio de Brescia della Mille Miglia' (not a real Mille Miglia, it was not a single lap of Italy and nor did it go through towns) did bear SS insignia and iis michievious to suggest it did not. a few years ago I had a German girlfriend. who was liberal in her views. Her father had been a senior engineer on the Kiel Canal and he had joined the SS to help his career. We met up once and he was a charming man. The snag was that under Nazi race laws my son would have been headed for a death camp. His maternal side is German-Jewish. It does not matter that his grandmother converted to Christianity, and his mother was Christian, while his father is atheist, his great-grandmother was Jewish and that was once enough to guarantee him a death warrent. I can not even spot NSKK or any other Nazi symbol on the car. The car was not an SS entry in that sense of the word, only Hanstein was SS driver and (so reported by Aichele) the SS put some pressure on the team to install him in the cockpit. But as you can see on this last picture the black personal (maybe better than to call it "private") car of von Hanstein with the SS "logo" on it was a permanent part of the team caravan, so maybe this is the cause for the confusion. This victory photo, on the other hand, has been doctored. The whole image has been sharpened for publication, to disguise the fact that an NSKK logo has been added to Bäumer's overalls and that the SS runes on von Hanstein's have been retouched. Re-touching of press photos is of course certainly not confined to politcal situations. Over the years I've had in stock hundreds of motor racing prints used by newspaper, almost all of which have some retouching to a lesser or greater degree. This is all pre photoshop of course but even those from the 1990s can be found with 'tip ex' and black marker pen used to enhance a poorly defined outline or to remove a shadow or even a person from the shot. Some are a work of art in themselves, other are often rather comic when seen in the raw. Have a look at poor old Chunky Chapman...Where's his lower half gone? The back wing, engine cover and tyres have also been airbrushed (in the physical sense) to sharpen them up. Obviously only a section of this 1982 image was intended to be used, otherwise Colin would have vanished entirely! To his credit in my view, the Baron never hid that he was a member of the SS, unlike some others discussed in this thread. Perhaps we shall never know the true reasons why Von Hanstein joined in the first place, however the accounts that I have read portray him as a middling soldier at best. 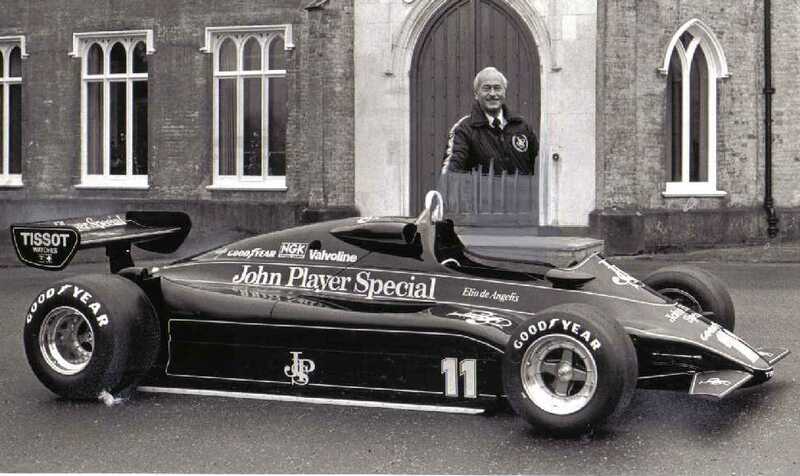 I certainly have the opinion that he was not the stereotypical SS officer that we have long reviled, and without excusing his membership in the SS, his many contributions to motorsport during the remainder of his life should properly serve as the legacy that forms our memory of the man. Many of us have likely encountered far worse sorts than the man Von Hanstein proved himself to be. Let the good Baron rest in peace gentlemen. I absolutely agree with Dennis. Sorry to say - but HvH had a very bad personal reputation before the war because his very rude attitude to other drivers! After a long struggle my father had with him in the 50ies until mid-60ies about one very specific trophy that was given by Hühnlein to my uncle after the 1940 MM my father gave up. I met HvH in the late 80ies and asked him about some infos about my uncle and the MM. Of course we discussed this "issue" my father had with him. He confirmed to me that this trophy was in his possession but told me also "...SS-men never give up...!" I was shocked by this statement! And don't forget HvK's outrageous remarks about circuit/driver safety issues at Montjuich in 1975 and at Nürburgring a year later. It almost seemed that the man had lost his mind. After I met him in the late 80ies I got a letter from him. After reading his comments I first wanted to call the doctores to take him away....! and had forgotten to remove the nationality ID ovals with SS on them. Oopsie. If they had been made by Swallow Sidecars, even worse. At least they wouldn't have been the lightning bolt rune thing. "The F1 drivers don't like the Ring because they are paid too much." Does any among the German speaking TNF members remember that ever so funny TV interview with him in which his name was constantly taken off by the commentator? Something like: Flutschke von Schwanstein, Rutschke von Kantstein, Mutschke von Mahnstein etc. Who dunnit and when and on what channel was it broadcasted by then? Yep, I remember that! The interview was done by Heinrich Casdorff in his talkshow. Many years ago. Also Castorff is dead now since almost 10 years. Was it Claus Hinrich Casdorff? And they say the Germans don't have a sense of humour. Sat's rrright! Ve don't have humor, and se rrresponsible person vas immediately ejected from German Television! This thread is a load of you know what. What difference does it make if Fritz Huschke Sittig Enno Werner von Hanstein was in the SS? Everyone of us, in a similar position at the time, would have fallen foul of the same situation. What has this to do with motorracing. Hang on, that's just not true, is it? There were NO other German racers in the SS, so finding out how/why HvH joined might just be interesting and relevant, so even if all of us were in the same position it does not seem to have been compulsory to join it. As it is, he seems to have been integrated it via a takeover, but presumably the horseriding club was fairly Aryan in make-up anyway, a sort of upper class organization. Perhaps more to the point, at a time when the Nazis were waging aggressive war in France, Poland, Belgium, the Netherlands and trying to get to Britain, what does it say about someone who wore SS insignia in a motor race? yep! it was him! HvH became very confused! This edition of the show came after Senna`s death in Imola. Also Nikki Lauda was interviewed but was too cool to let Casdorff come "too close"! I remembered it this way (post # 91). I have the Niki Lauda interview by Claus Hinrich Casdorff registered on VHS video tape. Whilst it isn't relevant to v. Hanstein's membership you could get awarded honorary membership, whether you wanted it or not. I can't immediately turn it up, but in his book (title "We at Porsche" in English) Dr. Ferry Porsche told of a meeting where Himmler asked him if he was a member of the SS: being told that he was not, he told his adjutant to see to it, and Porsche got his Honorary SS membership soon after. See also posts 7 and 8 in this thread. after 60 + years perspectives seem to shift on what it meant to be a Nazi and a full fledged SS member. Lets just say that time does not clear their actions. The Baron, could have choosen not to be an SS member, the Baron could have chosen not to display the SS insignia (if others were indeed members as well, they choose to be more discrete). letting him rest in peace is one thing, but calling him good might be a stretch.